This is the can of chestnut puree that I bought, among other finds, from that Italian food store. I can thank it for leading me to this recipe. As I mentioned, the ingredients were listed as simply chestnut puree and water. A tiny amount of corn syrup might be involved but you want to make sure you don't use sweetened chestnut creams or spreads. When you open up the can, you'll find a rather unattractive congealed-looking mass of chestnut puree. Just scoop out what you need and fluff it up a bit with a fork. The chestnut puree gives the chocolate mixture a thicker texture. 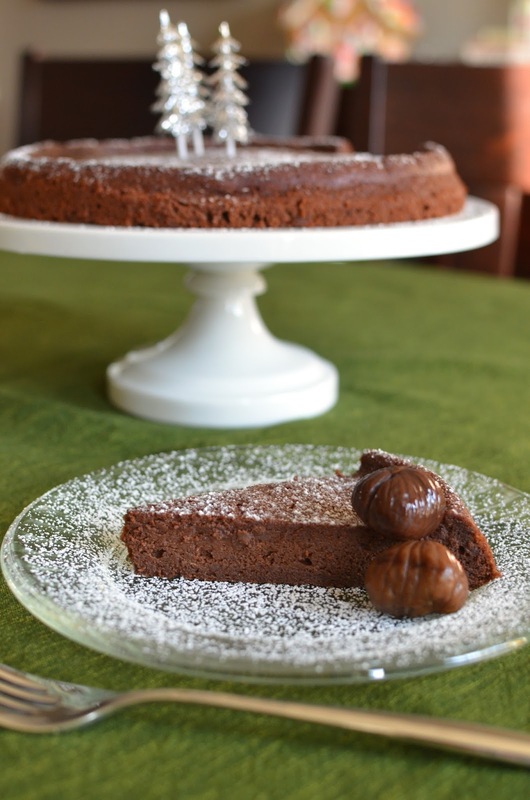 I like seeing some bits of small chestnut lumps in the finished torte to give a reminder of what we're eating. I baked my cake in a 9-inch round springform pan instead of an 8-inch because I only have that. The cake bakes in about 20 minutes and the whole thing is easy to put together. I made mine a day in advance for a gathering. I let the cake cool in the pan and wrapped it up before unmolding the next day. This is the kind of cake that stays moist and fudgy for a few days, great for a make-ahead. I decorated my torte simply with a thorough dusting of powdered sugar (the cake being so moist, the powdered sugar on the surface of the cake will "melt" so be prepared to do it just ahead of serving). I thought a few kitchy silver Christmas trees would be fun here so I put them to use. Other serving suggestions include some brandy or rum-flavored whipped cream on the side. All flourless tortes are great with some whipped cream. I had plain but needless to say, brandy or rum-flavored would be even better. * I used 54% cacao chocolate. Go with one labeled 50% to 62% so as not to overwhelm the flavor of the chestnuts. ** I used plain chestnut puree. You can also mash up any plain vacuum-packed or even jarred chestnuts. Do not use sweetened chestnut cream/spread. Preheat oven to 375 degrees. Set a rack in the lower third of the oven. Line the bottom of a 9 or 8 inch by 3 inch springform pan with a round of parchment paper (you can omit this if you plan to serve the cake on the cake bottom). Melt chocolate and butter in a heatproof bowl set on top of a pan of just simmering water (or use the microwave and heat on medium-power for 1 1/2 minutes). Remove from the heat and stir until smooth. Stir in the chestnuts, rum or brandy, vanilla, and salt. Whisk in the egg yolks as well as 6 tablespoons of sugar. Set aside. Place egg whites and cream of tartar into the bowl of a stand mixer fitted with the whisk attachment. Beat on medium speed until soft peaks form, then gradually add the remaining 2 tablespoons of sugar, beating at medium-high speed until stiff peaks form but egg whites are not dry. Scoop one-quarter of the egg white mixture into the chocolate mixture and fold in using a large spatula. Scrape in the remaining whites and fold gently together until just combined. Transfer the batter into the cake pan, smoothing it around evenly across the pan. To serve, run a knife around the sides of the cake and remove the sides of the springform pan. Transfer to a serving plate or carefully invert the cake on to a rack, remove the parchment paper lining and invert again to a serving plate (this requires a very gentle hand since the cake is very moist and fragile). Dust with powdered sugar and serve with whipped cream, if desired. You are too kind, Alessandra. Thanks for stopping by. Oh Monica - leftover chestnut puree? I would make another torte like this! I would skip lunch myself to eat a slice of this - for several days - haha. Love the adorable decoration - that is so smart. I can hear the moaning now! I love those little Christmas trees on top! Where did you get those from? 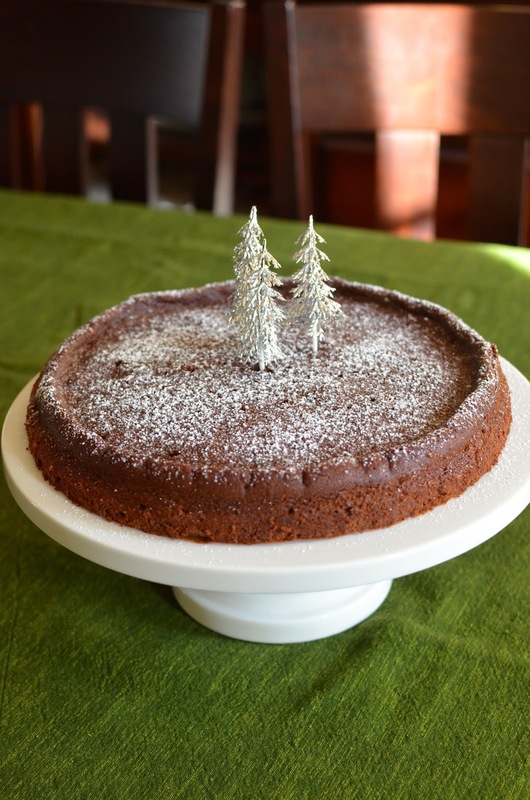 Great torte and so perfect for the holidays! I bought them maybe 2 years ago and almost forgot about them! I can't remember exactly where I got them but I know I ordered them so it was probably from bake it pretty. Thanks, Ashley. Oh my goodness, chestnut puree??? I love the sound of this cake! Chocolate is perfect with the sweet nutty flavor of the chestnuts! You can really see how moist and fudgy it is and the dusting of powdered sugar makes this look so elegant. The tree is just adorable and so fun and festive! Such a lovely dessert for the holidays! I have to get some chestnut puree too! Your torte looks amazingly moist and tempting! This looks so rich and decadent!!! Looks absolutely delicious ! Loved the pics too. Genius! Love the idea of chestnut in a flourless chocolate cake; I bet the flavors go wonderfully together (: Have a good weekend! I think Alice Medrich falls in the category of "genius", particularly in the world of chocolate desserts. I knew I couldn't go wrong. You have a great weekend; hope it's relaxing! The trees were a great shortcut to decorating this thing! : ) Thank you and hope you're having a great holiday season. I saw fresh chestnuts for the first time at the store the other day and thought of you! I plan on buying some this week ... I need to go back through all your recipes to look at what I want to make. This torte looks pretty darn delicious! If you try the fresh chestnuts, you might just want to cook it (I boil for ease but roasting is obviously popular) and eat it whole like that! I would totally recommend the chestnut soup but I don't know if you want to go to the trouble of removing the skins and all when you can just buy them prepped (I use jarred for that). What a beautiful torte Monica!! Love the chestnuts. Thank you, Jessica. I love tortes of all kinds. I'm making something chestnut for Christmas! I absolutely love it as an ingredient-I think I could eat the sweetened puree straight from the jar! This looks wonderful! No doubt you will make something amazing. I just adore chestnuts in every which way and I'm glad you like it too. I have been tempted to eat chestnut cream right from the jar many times. I love seeing all the chestnut desserts you've been whipping up! This torte is a beauty. Looks so rich and delicious. Thanks, Joanne. I thought I'd give one of my favorite foods a little attention. I'm all for the chestnut recipes you are making. They all look amazing and decadent. What's not to love? Bring them on! Hi Monica, I bet this is a delicious combination, Will have to get my hands on some chestnuts after seeing this. Beautiful looking torte. So sweet of you, thanks Cheri! This cake looks lovely! I love chestnuts too, but don't bake with them nearly enough. I'm going to search for chestnut puree at my local Italian supermarket! Thanks, Amanda. It's easy to make if you get your hands on some of that puree. Have a great holiday! Sounds absolutely delicious. Those pictures with the miniature tree is just too adorable. In fact I was looking to bake a torte this weekend, you've given me a great idea. Thanks. Hi Asha - those little trees and things like that do come in handy at Christmas time. ; ) A torte is a great easy-bake for a group. Hope you have a wonderful weekend.